The WMF colanders are the perfect addition to a well-equipped kitchen. Let the products make your everyday life easier and reach your culinary goal faster! When cooking, it is crucial to keep a close eye on cooking times. This does not just apply to meat, but also to pasta, rice or vegetables. It is not for nothing that such a fuss is made of the definition of the term "al dente" when it comes to cooking pasta. You can use WMF colanders to strain your side dishes quickly or leave your lettuce to drain. They also come in handy for many other things in the kitchen. Colanders are large bowls, often with a diameter of around 20 to 24 cm, which have large holes in their lower half. These holes allow excess liquid to drain away. This is important when washing lettuce, which needs to be dry enough afterwards to absorb the dressing well. Salad strainers often come with a stand or with feet, so that they can easily stand alone without restricting the flow of the water. Colanders are often used for straining pasta. Whether you use them for pasta, boil-in-the-bag rice, vegetables or potatoes – all these side dishes are cooked in boiling water. Once the cooking process has finished, you must pour the water away quickly, otherwise the food will continue to cook, even if you have already switched off the hob. Simply tip the entire contents of the pan into the colander and let it all drain well, before returning the food to the still-hot pan so that it stays warm. Colanders and pasta strainers from WMF offer the best quality at a reasonable price.  It goes without saying that WMF uses only high-quality materials in the manufacturing process. The rust-proof Cromargan® stainless steel, which is patented by WMF, is extremely durable, resistant to scratches and you don't need to worry about cleaning it in the dishwasher. However, as with all colanders, take care to wash the colander immediately after straining food containing starch, such as pasta. The starch contained in the cooking water can namely attack the material over the long term and leave it looking dull. Be impressed by the wide range of products at WMF and choose your colander or pasta strainer now – we have a model to suit everyone!